Ramsey & District Angling Society fished on a windswept Factory Bank on Sunday. They used the pegs further downstream opposite the factories to try and gain a little shelter from the elements. But it doesn’t seem to matter where they draw or fish on this venue, Paul Kilby has become all but unbeatable. 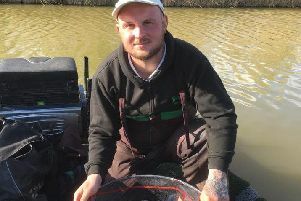 He recorded yet another match win, this time with 12lb 4oz of small roach and perch from peg five. Runner-up was Andrew Kilby with 9lb 7½oz, followed by Keith Rayment with 7lb 11oz. There has been some very good news with regard to re stocking the River Nene, with fingerling barbel going in at Barnwell, Elton and Alwalton and roach introduced below the city centre fly-over. Over the past few years’ barbel fishing along the lower Nene has dramatically increased thanks to some very hard work by Peterborough DAA in conjunction with the Environment Agency.